Director – Tim Burton, Screenplay – William Broyles Jr, Lawrence Konner & Mark Rosenthal, Based on the 1968 Film Written by Rod Serling & Michael G. Wilson and the Novel Monkey Planet by Pierre Boulle, Producer – Richard D. Zanuck, Photography – Philippe Rousselot, Music – Danny Elfman, Visual Effects Supervisor – Bill George, Visual Effects – CIS Hollywood (Supervisor – Dr Ken Jones), Industrial Light and Magic (Supervisor – George Murphy) & Rhythm and Hues (Supervisor – Christopher Sjoholm), Additional Visual Effects – Asylum (Supervisor – Matthew McGuinness), Digital Fire Works & Pacific Title and Digital, Special Effects Supervisor – Ken Pepiot, Makeup Effects Supervisor – Rick Baker, Production Design – Rick Heinrichs. Production Company – The Zanuck Co/20th Century Fox. Aboard the space station Oberon, Captain Leo Davidson is a pilot assigned to tending the genetically-engineered intelligent monkeys used for test flights. When an ion storm comes, the station commander sends a monkey out to gather data. The pod goes missing and so Davidson defies orders and goes after it himself. However, the storm throws him through a warp where he crashlands on a planet. He soon finds himself hunted and then captured by talking apes who regard humans as no more than animals. He is caged by the chimpanzee scientist Ari who takes an interest in him. He organizes a breakout and heads into the desert along with Ari and several other humans to rendezvous with his rescue ship in the forbidden area that the apes regard as their place of origin. However, the ape general Thade has discovered Davidson’s extra-terrestrial origin and leads the ape army in an effort to kill the humans. Planet of the Apes (1968) is one of the genuine classics of the science-fiction genre. It was made on an A rather than a B-budget (as was usually the case for science-fiction of the era) by a studio at a time when science-fiction still remained in a ghetto. It became one of the biggest genre box-office successes in the era before the Star Wars (1977) blockbuster. It was also the first science-fiction film (at least that did not feature a monster) to become a major franchise. It produced four sequels – Beneath the Planet of the Apes (1970), Escape from the Planet of the Apes (1971), Conquest of the Planet of the Apes (1972) and Battle for the Planet of the Apes (1973) – but unlike almost any other multi-sequel franchise these were not copycat sequels but ones that the series elaborated out into a highly inventive future history. There were also two tv series, both short lived – one live-action Planet of the Apes (1974) and the all-but-forgotten animated series Return to the Planet of the Apes (1975) – as well as various novelizations and a long-running Marvel comic book. This remake was announced on and off for about six years. During that time, it passed through various directorial hands, ranging from names that one greeted with enthusiasm – Oliver Stone, director of Platoon (1986), JFK (1991), Natural Born Killers (1994) – to indifference – Philip Noyce, director of Dead Calm (1989), The Saint (1997) and The Bone Collector (1999) – to cringes of horror – Chris Columbus, director of Home Alone (1990), Bicentennial Man (1999) and Harry Potter and the Sorcerer’s Stone (2001) – and was for a long time to have starred Arnold Schwarzenegger. Finally, it emerged with Tim Burton at the helm. Tim Burton is of course one of the most quirky and perpetually worthwhile genre directors working in the Hollywood mainstream. Burton had previously up to that point directed films such as Beetlejuice (1988), Batman (1989), Edward Scissorhands (1990), Batman Returns (1992), Ed Wood (1994), Mars Attacks! (1996) and Sleepy Hollow (1999). (See below for a full list of Tim Burton’s other genre films). Tim Burton’s films usually centre around oddball characters or outsiders – Pee Wee Herman, Batman, Edward Scissorhands, Ed Wood, Jack Skellington in The Nightmare Before Christmas (1993) – that Burton seems to have enormously endearing sympathy for. Burton seems at home with large budget studio vehicles like the Batman movies, Sleepy Hollow, and clearly this, where he is able to immerse himself in the complete artistically detailed creation of another world. For the most part, Planet of the Apes 2001 does the things a sequel should do and fleshes out and more lavishly remounts the original. As in any Tim Burton film, the sets, music, photography and in particular the costumes are dazzling. Burton has also recreated the original as a large-scale action film with visually dazzling climactic sequences featuring clashing armies of massed apes and humans. Of course, the one crucial area that the film either sinks or swims on is the credibility of the ape makeup. To this extent, Burton has employed Rick Baker who is widely acknowledged as Hollywood’s premiere ape expert, having created the apes in the likes of King Kong (1976), Greystoke: The Legend of Tarzan, Lord of the Apes (1984), Gorillas in the Mist: The Story of Dian Fossey (1988) and Mighty Joe Young (1998). Expectedly, Rick Baker does an extraordinary job. There is both an amazing fluidity to the expressions on his apes’ faces and great versatility to the variety of designs. What is also notable is the extent to which the prosthetics are blended so that they are incredibly ape-like, yet also allow the features of the numerous name actors beneath to be clearly recognizable. The film also makes the apes more ape-like than the original – where they swing, hang upside down, run on all fours, conduct amazing leaps thirty feet through the air and where we even get to see Helena Bonham Carter writing with her feet. Planet of the Apes 2001 is similar but not the same story as the original. Certainly, the story follows the original along the same paths and touches most points – astronaut(s) go through a time warp, crash in a lake on an alien planet, the introduction of the apes during a ferocious hunt and capture of humans, the hero being taken in by an eccentric chimp scientist, the militant gorilla general, the escape into the desert wasteland of The Forbidden Zone wherein lies evidence of once human superiority over the apes and a twist ending tying it all to Earth’s past. 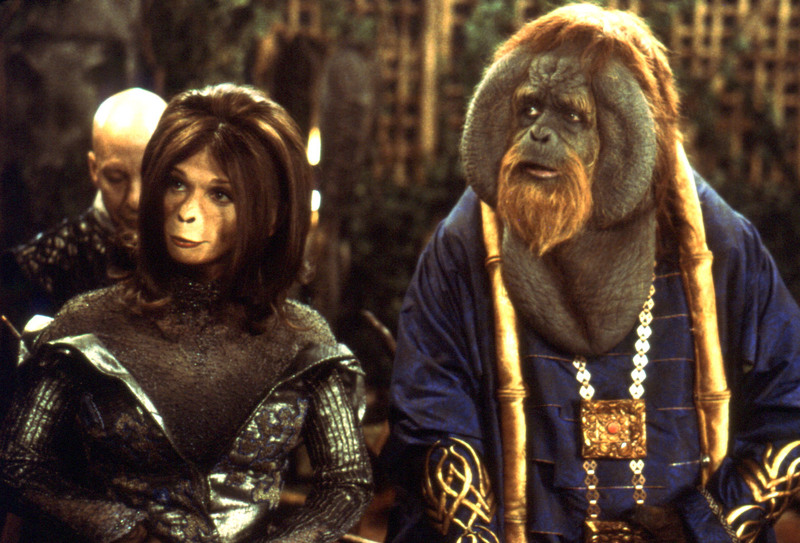 Of course, there are some crucial areas where Planet of the Apes 2001 is different. The humans on the planet now speak and the apes no longer wield guns. Most importantly, this version lacks the level of social commentary that the original operated on. There is none of the extended misanthropy of Charlton Heston’s great monologues on the human condition during the trek through the desert. 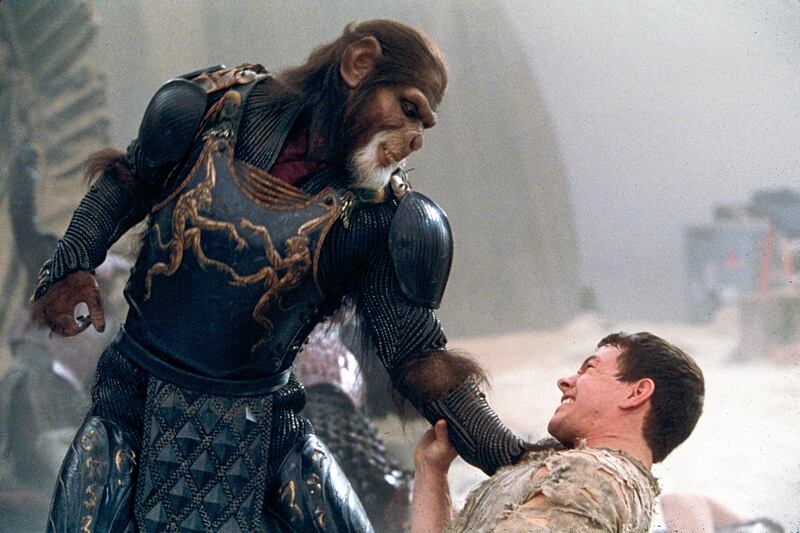 Crucially, the remake lacks the figure of Dr Zaius – there is Tim Roth’s General Thade but this character is modelled more along the lines of the militant gorilla generals that turn up in Beneath the Planet of the Apes and Battle for the Planet of the Apes and, as a result, there is nothing of the biting social satire of the original’s trial sequences. Tim Burton certainly embellishes the pictures of apes mirroring human behaviour, padding out the background of the ape culture a good deal more with images of apes gambling, begging, ape teenagers hanging out and listening to music, Lisa Marie’s chimp doing a seductive dance in a negligee, even an ape with a human on the end of an organ grinder. However, the effect is more cute pastiche than satire. Where the original Planet of the Apes engaged on a level of barbed social satire where apes were used to mirror and savagely indict the human condition, here we merely have a series of vignettes dominated by Burton-esque quirky eccentricity. This is a contrast that is best seen in the difference between the two heroes. Mark Wahlberg is probably a better actor than Charlton Heston. He specialises in tightly wound and internalised roles but the film here swallows him up, he is blank as a character – Tim Burton gives him nothing to do except run around until about the last twenty minutes when he finally gains some heroic stature. He is completely upstaged by the apes – especially Helena Bonham Carter’s chirpily eccentric variation on Kim Hunter’s performance in the original (the character that naturally Burton has the most sympathy for). In complete contrast, Rod Serling’s dialogue in the original gave the usually wooden Charlton Heston a much better opportunity to shine and Planet of the Apes 1968 is one of his best screen performances. Planet of the Apes 2001 is by no means a bad film – it just operates wholly on the level of action adventure and never engages on the level of ideas. There is also the matter of the ending. Tim Burton reportedly shot three different ones. The one we do end up with comes with three major twists. You can see all the plot arcs being set up and in none of these twists does it take too much to guess what is going to happen. The first of these about the origins of the ape society is a variant on the shaggy dog ending that was pulled at the end of Star Trek – The Motion Picture (1979). The second about the ape messiah is just hokey in its convenience. The final twist ending is one the script has taken direct from the original Pierre Boulle novel – and which the film also sort of tries to connect up with and conduct as a variant on the Statue of Liberty climax from the original. The Statue of Liberty ending in the original was an extraordinary image – it is one of the most resonant and powerful in science-fiction cinema. In comparison, this ending produces only a puzzled scratch of a paw to the head where one is not sure what it means at all. Rise of the Planet of the Apes (2011), Dawn of the Planet of the Apes (2014) and War of the Planet of the Apes (2017) were entries in a reboot series showing the origin and evolution of ape intelligence. Tim Burton’s other films of genre interest include:- the kitsch Pee-Wee’s Big Adventure (1985), the bizarre ghost story Beetlejuice (1988); Batman (1989); the genteel artificial boy fairy-tale Edward Scissorhands (1990); Batman Returns (1992); Ed Wood (1994), a biopic of the world’s worst director; the alien invasion spoof Mars Attacks! (1996); the ghost story Sleepy Hollow (1999); Big Fish (2003) about an habitual teller of tall tales; Charlie and the Chocolate Factory (2005); the stop-motion animated Gothic Corpse Bride (2005); the horror musical Sweeney Todd: The Demon Barber of Fleet Street (2007); Alice in Wonderland (2010); the film remake of the tv series Dark Shadows (2012) the stop-motion animated Frankenweenie (2012); Miss Peregrine’s Home for Peculiar Children (2016); and the live-action remake of Dumbo (2019). Burton also produced Henry Selick’s darkly brilliant stop-motion animated fantasies The Nightmare Before Christmas (1993) and James and the Giant Peach (1996); as well as the live-action conte cruel Cabin Boy (1994), Batman Forever (1995) the animated 9 (2009), Abraham Lincoln, Vampire Hunter (2012) and Alice Through the Looking Glass (2016). The Death of “Superman Lives”: What Happened? (2015) is a fascinating documentary about Burton’s failed Superman Lives project. (Winner for Best Makeup Effects, Nominee for Best Actress (Helena Bonham Carter) and Best Supporting Actor (Tim Roth) at this site’s Best of 2001 Awards. No. 7 on the SF, Horror & Fantasy Box-Office Top 10 of 2001 list).